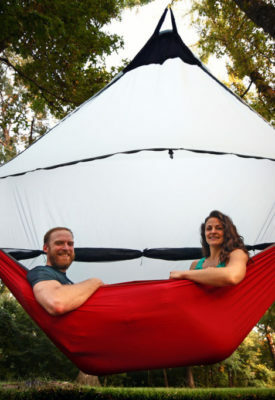 Vicksburg natives, Richard and Juli Rhett, owners of Sierra Madre Research, a company that creates innovative, high quality camping equipment, such as hammock shelters and other accessories, were on the season premiere of ABC’s “Shark Tank,” the show where entrepreneurs try to convince wealthy investors (Sharks) to buy a stake in their budding companies. The Rhetts walked away with the sweet deal they’d asked for: 15 percent of their company for $175,000. Richard Rhett says he and his wife Juli received an amazing blessing when they attracted the attention of one of the producers of the show. The rest as they say is history. The Rhetts went through the process and once on the show, caught the attention of English business magnate, Richard Branson, founder of the Virgin Group, a conglomerate that controls many companies. Rhett says that was really one of the main reasons for founding Sierra Madre Research in the first place, to help fight the clean drinking water crisis that affects millions of people worldwide. The company, presently located in Vicksburg, is relocating to Chattanooga, Tenn. sometime in 2018 to try and get a little closer to their target audience. Rhett feels this will be a good business move for Sierra Madre Research. Rhett adds that as a Christian, he believes wholeheartedly that what happened to he and his wife and their company with “Shark Tank” was divinely-inspired. As far as what’s next for the company and he and his wife, Rhett says that they plan on moving forward enthusiastically.